The latest entry into OnePlus' teaser campaign for its next smartphone has been revealed today. 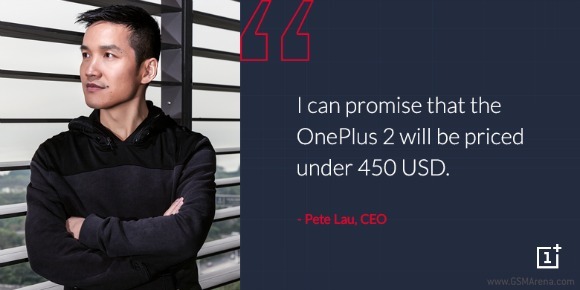 This time we get a quote straight from the company's CEO, Pete Lau. As you can see in the image below, he promises that the OnePlus 2 will be priced under $450. We assume that means it will actually start at $449. That's quite a departure from the OnePlus One's initial pricing of $299 (for the base model with 16GB of storage). Furthermore, this handset now starts at just $249, making the OnePlus 2 have quite a premium when compared to it. The chipset used has something to do with that, as OnePlus has already explained. The company chose Qualcomm's Snapdragon 810 for the job, which apparently is significantly more expensive than the 801 used in the OnePlus One. The OnePlus 2 will have a fingerprint scanner and a USB Type-C port and will be officially outed on July 27 in virtual reality. We're sure OnePlus will keep teasing it until then. Thanks for the tip, Saurabh Ghosh!